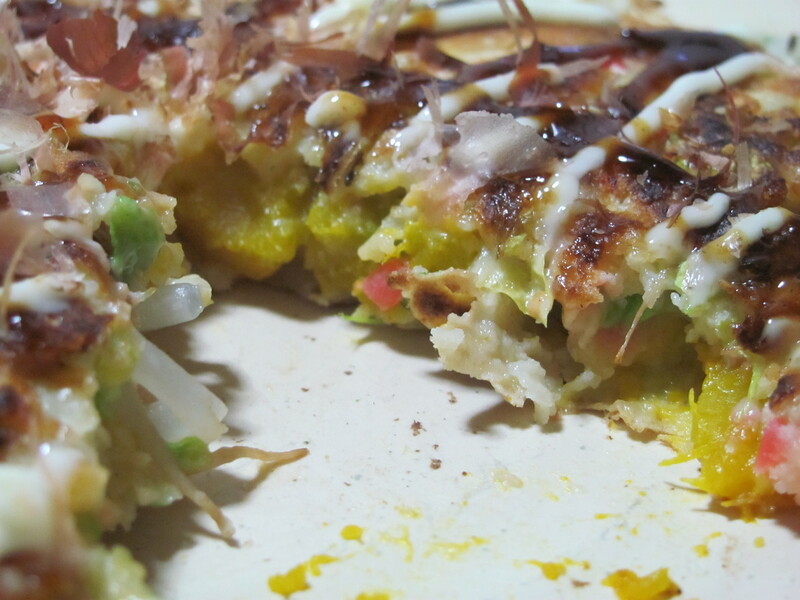 Kabocha-Stuffed Okonomiyaki – I'll Make It Myself! Every food blogger with an interest in Japanese food is required by law to have a post on okonomiyaki, so today, I’m going to show you how to make my favorite version, which is stuffed with my favorite vegetable, kabocha squash. Okonomiyaki (henceforth not italicized) is sometimes described as a savory pancake or as a Japanese pizza. What it actually entails is a batter made mainly of flour, egg, water, and baking powder, which is mixed with finely chopped cabbage and seasonings. To this batter, one adds meat or vegetable “toppings” (hence the pizza comparison) to one’s liking (hence the name, which could be translated as the “As You Like It Cooked Item”). This mixture is cooked in a frying pan or on a griddle and topped with okonomi sauce, mayonnaise, nori (seaweed), and bonito flakes. The store-bought mix, which is what I use, contains seafood, but you can also make vegetarian or vegan versions or make the batter from scratch, as detailed on Just Hungry. Normally I don’t go for premade mixes–you will not find boxed cakes or pancake mix in my pantry–but the advantage of the okonomiyaki mix is getting the nagaimo and seafood seasoning into the flour. If you prefer to make the flour mixture yourself, just follow the instructions for that in the links, adjust to the appropriate serving size (mine is for two), and add the mashed kabocha per the instructions below. As for toppings/add-ins, okonomiyaki staples included shrimp, squid, pork, kimchi, mochi, corn, and cheese. To make a pizza comparison, pork-and-kimchi, mixed seafood, and mochi-cheese are the Hawaiian, pepperoni, and margarita pizzas of the okonomiyaki world. Unforunately, vegetables added to okonomiyaki aren’t as popular in restaurants. To make vegetable-based okonomiyaki, incorporating quick-cooking vegetables like greens and corn straight into the raw batter with the cabbage would work well. However, this recipe is inspired by a kabocha okonomiyaki I ordered at Roast in Nonoichi. I love both okonomiyaki and kabocha, so when I saw it on the menu, I had to try it. I had no idea how the kabocha would be incorporated when I ordered. The kabocha was steamed and layered into the batter instead of diced and mixed in or layered on top like most toppings. (Of course, this makes way more sense, because kabocha would probably not cook well as a raw mix-in). It was delicious, and the only natural course of action was to figure out how to make it myself! I love serving this because I like the layered effect; it’s visually interesting, unusual, and is very easy to make. Okonomiyaki has infinite possibilities–what’s your favorite? Serves 2; makes 2 okonomiyaki. 1. If you haven’t mashed the kabocha yet, remove the peel (to hasten the cooking), chop into bite-size pieces, and boil until tender. Drain water well and mash with a potato masher or sturdy fork. Set aside. 2. Chop the cabbage and green onion (optional) into very thin strips; chop the bean sprouts. Set aside. 3. Mix the okonomiyaki flour and water together in a large bowl. 4. Add the egg, cabbage and bean sprouts, green onion, and pickled ginger (and any other desired mix-ins) and mix well so that everything is coated in the batter. 5. Divide the batter evenly into the two bowls (one for each okonomiyaki). 6. Heat the pan over a medium flame and add a little bit of the sesame oil, making sure to grease the whole pan (using a paper towel to do so helps). Place half of one serving of batter carefully into a flat, round pancake shape, leaving enough room for rotating and flipping. Spread half of the kabocha on top, then spread the remaining batter for that okonomiyaki on top to cover the kabocha. 7. Optional: place lid on top to help the okonomiyaki cook more evenly. 8. Cook until the bottom is browned; turn with both spatulas to get the bottom done more evenly, especially on a griddle. When you flip the okonomiyaki, use both spatulas and have courage! 9. Cook the okonomiyaki through, making sure the batter is cooked. 10. Repeat steps 6-9 for the second okonomiyaki. 11. Add condiments right before serving. *Okonomiyaki flour is ~350 calories for 100 grams. This calorie count is based on using the lower-calorie mayo and includes the optional ingredients. **I like Otafuku brand （オタフク). **Most people use Kewpie (キューピー), I prefer Pure Select Super Low Calorie, Calorie 70% Cut (ピュアセレクト®　スーパーローカロリーカロリー７０％カット) (the one with a green cap) because it is lower in calories and has a longer shelf life. I almost never use mayonnaise, so it takes me forever to get through a bottle. This sounds amazing and delicious. I have not had okonomiyaki in a very long time. Yours looks quite interesting, too! I can’t say I’ve ever seen braised tofu, though–it looks like what we call seitan in the US. Would like to try it someday, though! The first time I had okonomiyaki I didn’t have a clue what I was about to eat. I didn’t know what bonito flakes were. All I knew was that there was something moving on what looked like a frittata, and I had a few Japanese men smiling at me. I dag in, and I never regretted it. It is by far one of my favorite Japanese things. But I never made it at home. It’s really easy to make at home! When I studied abroad in Osaka, my host parents cooked this all the time, and I missed it so much when I came home to the States. Even in southeastern Michigan, where there are Japanese bakeries (Ann Arbor, Novi), I couldn’t find this anywhere. I love making this version because it’s healthier and it reminds me of those days in Kansai.